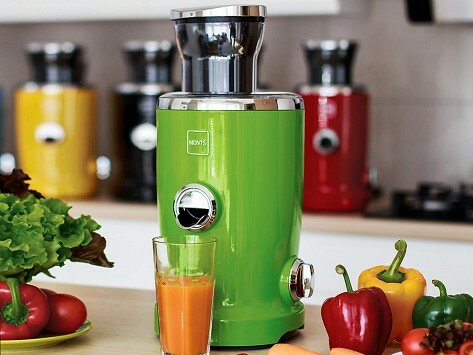 Juice, press, and puree with a powerful home juicer made to give you more. Its four functions (citrus press, press and centrifuge, juicer, and pureer) extract up to 20% more juice that's more nutrient-dense (with less pulp) than some other juicers can. One button is all it takes to make quick work of fruits and veggies, including bananas and leafy greens. A wide-feed chute automatically pulls in fruits and vegetables and the drop spout eliminates drips. After that easy juice- or smoothie-making, all the parts go in the dishwasher for easy cleaning. Dimensions: 8.7" x 9.1" x 16.9"
I did a lot of research before purchasing this juicer, I visited some stores to look at other juicers to make sure to get the right machine. After feeling good about the Vita Juicer I looked for the best deal. The Grommet has the best deal and also answered to the questions I had before spending the money. I ordered from them and shipping was pretty fast and free. I LOVE this machine. So simple to use and clean up is a snap. Juice made and clean up less than 10 minutes. The Novis Vita Juicer packs four—you heard us, four—juice-centric functions into one sleek and shiny appliance. It can produce up to 20% more juice than usual and it gets every last bit, resulting in more nutrient-dense juice (and less pulp). A citrus press works solo on things like oranges and grapefruits, or it can get an assist from a centrifuge for deeper juice extraction. On top of juicing fruits and veggies, this machine can puree them, too, to make smoothies or even baby food. When we tried the juicer out, we appreciated its versatility. It can handle things not every juicer can, like bananas, leafy greens, and hard veggies. A drop-spout limits messes and vibration-dampening feet keep noise down. All that functionality is made user-friendly, too—just one button is all it takes to get juicing.